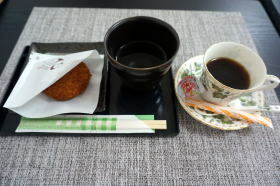 "Tondabayashi croquette" (ebi imo croquette) using locally grown shrimp-shaped potatoes as ingredients has become popular. 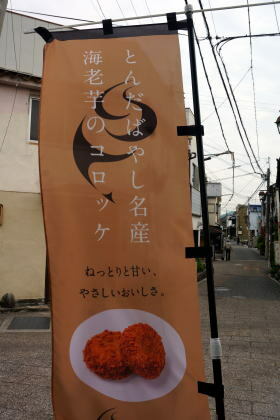 A restaurant where delicious fried Tondabayashi croquette can be eaten on the spot opened in Tondabayashi Jinaimachi historic district. 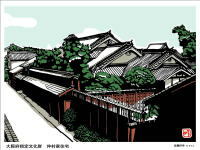 It is located along the Honmachi shopping street, just a short stroll from Kintetsu Tondabayashi Station as well as from Jinaimachi Kouryukan, or Jinaimachi Visitor Center. The shop opens only on Saturdays and Sundays, opening hours, opening hours: 10:00 – 16:30. The potato has a dusty texture and a slightly sweetness. "Welcome! 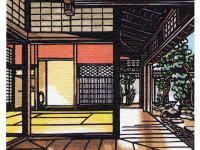 Tondabayashi Business Collaboration Promotion Council" is the business entity. 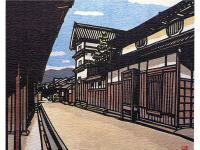 The ebi imo. 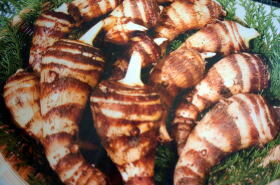 literally shrimp-shaped potatos which is a kind of taro, is specially produced in Nishi Itamochi area in Tondabayashi city and it is a high-class food ingredient indispensable for the traditional "Imobou" cuisine of Kyoto. 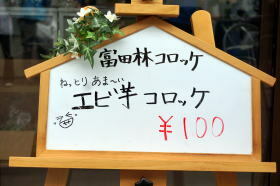 It is shipping to the restaurant in Kyoto starting in November for several months every year. The potato has a dusty texture and a slightly sweetness. 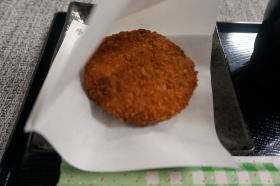 It is OK to sit and eat freshly fried croquette in the store, of course it is OK to take it out as it is in your hand. 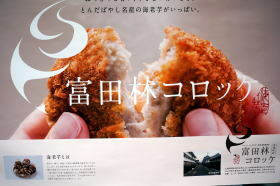 "Tondabayashi croquette" is also widely known for in-car advertisement of Kintetsu train, and some people come to buy by train all the way from afar. 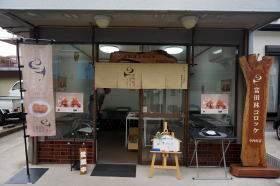 It may happen to see recently a queue in front of the shop, so please be sure to drop in at the shop to eat the excellent food in the weekend. 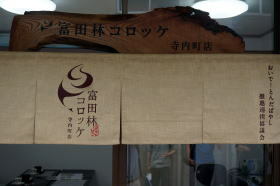 "Tondabayashi croquette" is an agricultural, business and industrial tourism collaboration project subsidized by the country and Tondabayashi municipality, and the "Welcome! 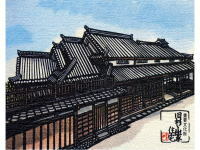 Tondabayashi Business Collaboration Promotion Council" is the business entity.